If you manage a data center that needs to be moved, you’ll need the help of experienced professionals who have the skills and industry connections needed to complete the job on-time, on-budget, and without compromising your security and expensive equipment. At AFP Global Logistics, we are the premier provider of professional data center relocation services in Washington, D.C., Maryland, Baltimore, and the greater Metro region. We can oversee every detail of the data center relocation process so that you won’t have to worry about a thing. 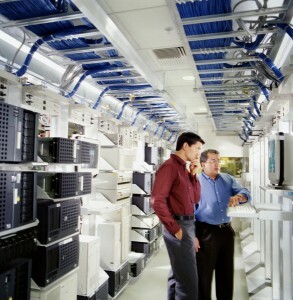 Data center relocation services require the help of industry experts. At AFP Global Logistics, we have a wealth of resources at our fingertips which allow us to relocate data centers efficiently, safely, and securely. We work with a network of data recovery specialists who are located throughout the country and are equipped with the right equipment and materials to ensure that your assets are relocated safely. In addition to relocating your data center, we can also handle full clean outs and decommissioned asset removal. Our comprehensive services and industry partnerships allow us to create a logistics solution that will be customized to meet your unique needs. Your data relocation services will be tailored to your unique needs and your assets will be handled differently depending on the ultimate destination of your equipment. If your old data center equipment will be recycled or donated, we will create a cost-effective packing and shipping solution. If your equipment will be refurbished and resold, we will bubble-wrap your goods and package them securely to ensure that they reach their final destination safely and intact. If you are looking for a trustworthy and experienced logistics company that understands the ins and outs of end-to-end data relocation services, look no further than AFP Global Logistics. We provide a full range of shipping and logistics services, and our 25 years in the business have given us the tools we need to create customized logistics solutions that are tailored to the needs of each client we serve. We have what it takes to provide the kind of data relocation services in Washington DC, Maryland, and the greater Metro region that your business needs to thrive. For more information or to start designing your own logistic solutions today, get in touch with AFP at 410.590.1234 (toll-free 800.274.1237), email us at info@afplus.com, or fill out our quick and easy contact form here! This entry was posted on Wednesday, September 14th, 2016	at 9:41 am	and is filed under News	. You can follow any responses to this entry through the RSS 2.0	feed. Both comments and pings are currently closed.